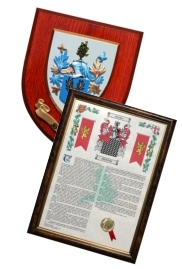 A Family Name in Print provides heraldry gifts such as Surname History certificates, Coat of Arms Engraved Glassware and Coats of Arms Shields for the perfect personal name origin or genealogy gift. We have been operating from in the UK for over 25 years. We are based in Dorset and all heraldry items are of the best quality and customer satisfaction is assured for your perfect surname history gift. We aim, on receipt of orders to have your surname history print ready for dispatch within 48 hours. Products like engraved glassware and handpainted shields take a little longer. If you have any queries about our surname history (name origin) database, heraldry & genealogy gifts or would like to place an order please contact us. Visit our genealogy shop today to buy perfect surname & coat of arms gifts UK.